Oyster Businesses Still Plagued By Gulf Oil Spill The oyster businesses in the Gulf of Mexico remain hobbled by the BP oil spill. Many companies are still operating with skeleton crews because of a scarcity of oysters. Proprietors also worry that people will shy away from seafood purchases even after oysters recover. Oysterman Mitch Jurisich steers a small boat around his family's oyster beds off the coast of Empire, La. He hasn't harvested many oysters since oil from the BP spill drifted into the area in June. The BP oil spill brought life and business to a temporary halt for people in Louisiana's seafood industry. Many have returned to work now that the well is capped. But the oyster business remains hobbled. Oysterman Mitch Jurisich and Al Sunseri, the president of P&J Oyster Co., have worked with oysters all their lives. Their families have been in the business for generations. Jurisich supplies oysters to Sunseri to sell to restaurants and markets. But when an NPR reporter first met Jurisich and Sunseri in June, both men were wondering whether their companies would survive the Gulf oil spill. Sunseri told employees at his processing facility in New Orleans not to come to work because they were out of oysters. And Jurisich had just found oil in the oyster beds that his family leases. 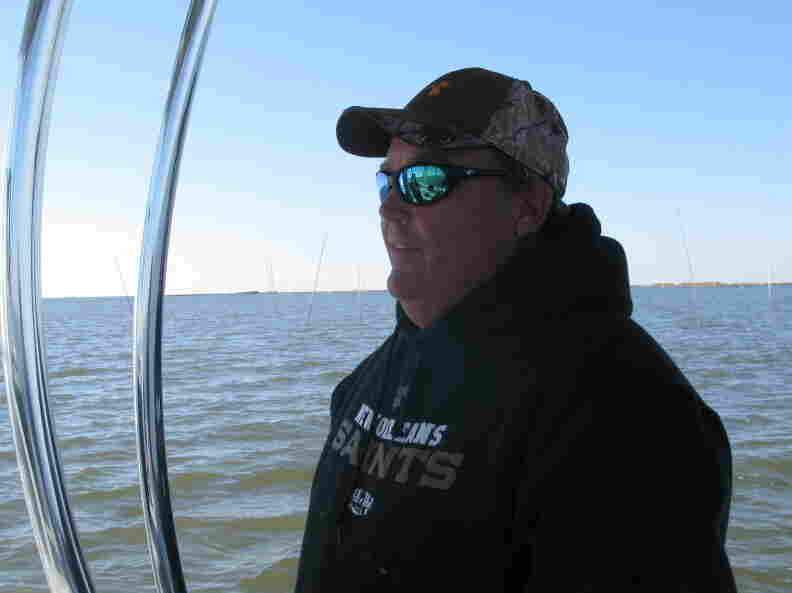 "It was a sad day," Jurisich says as he steers a small boat around his oyster beds. He hasn't harvested oysters in any significant quantity since then. Still, Jurisich says things are looking better than they did on that grim June day. We fought the oil. We won the battle in a way. And now we're fighting man's decision to stop the oil. They have destroyed more oyster crops than I think the oil would have ever. "The oil came in and the oil left, disappeared [or] whatever," he says. "And the mortality to the oysters [was] very minimal in most areas." But the stress didn't stop when the oil moved away. That's because the state of Louisiana built berms to keep the oil from reaching fragile wetlands. And two of the berms cut right through Jurisich's oyster beds. He estimates that about 20 percent of his oysters have been buried or smothered by drifting sediment. "We fought the oil. We won the battle in a way," Jurisich says. "And now we're fighting man's decision to stop the oil. They have destroyed more oyster crops than I think the oil would have ever." Every day, Jurisich goes out with a hand-held video recorder to document the damage. He says he knows there's a good reason for the berms, but he doesn't like the way they're being built. And he's skeptical that he'll be reimbursed for all his losses. 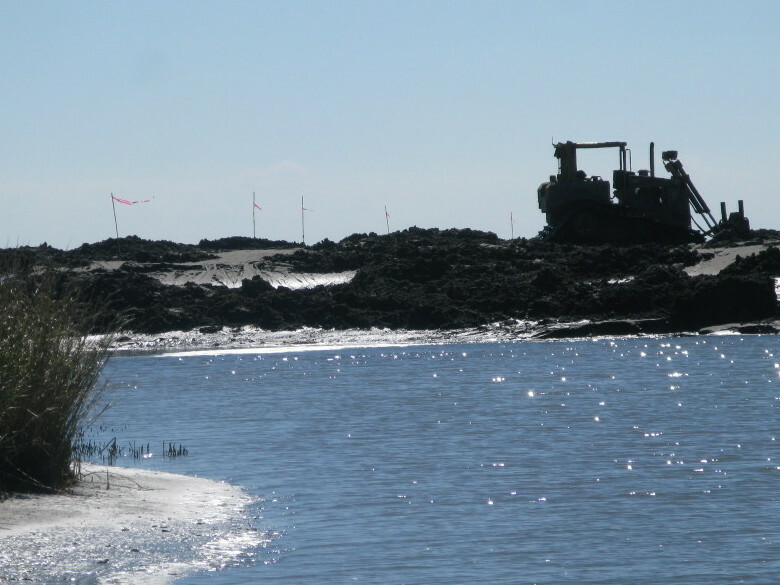 Heavy machine operators move sand around on a berm being built right in the middle of the oyster beds Mitch Jurisich and his family have leased for generations. 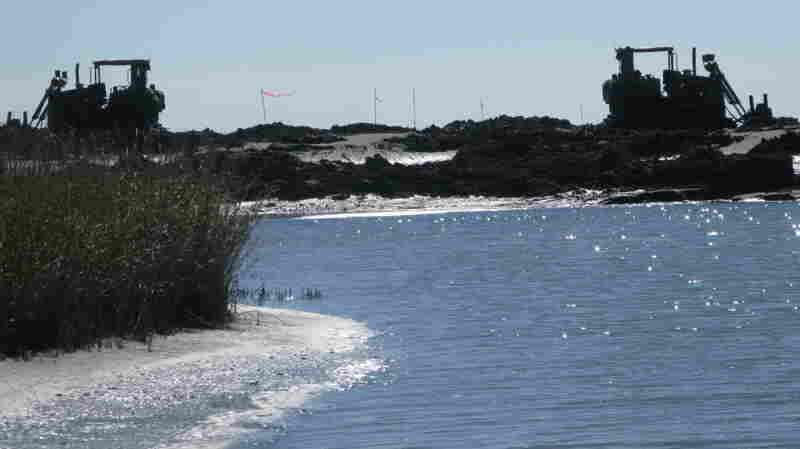 Jurisich estimates the berms, which were built to protect wetlands from the BP oil spill, have destroyed 20 percent of his oyster crop. Jurisich plans to start harvesting oysters again in February from the beds that haven't been damaged. That's when he'd normally start for the year. He's confident the oysters are safe to eat: He eats them every day right off the edge of his boat. "They go through a lot, you know, to get to our table," Jurisich says as he pulls up a half-dozen big oysters with a pair of oyster tongs, which look like two rakes wired together. "I'm glad they're as tough as they are, too, because it keeps me going." What he doesn't know is whether there will be any demand for his prized oysters. He's afraid memories of the spill will keep customers away. "I live here, work here and eat my homegrown seafood," Jurisich says. But he still thinks about the spill every day and remains concerned that others -- outside the Gulf Coast -- will shy away from seafood purchases. Concerns about demand weigh even more heavily on Sunseri because he processes and distributes oysters to restaurants and markets. "You know, the national market just isn't there," Sunseri says while sitting in the P&J Oyster Co. offices in the French Quarter of New Orleans. Back in June, the company was bustling with 20 full-time employees. Now, there is just a skeleton crew including Sunseri, his brother Sal and a couple of guys working part time. "We've never had to operate at this scale ever in my time, even following Hurricane Katrina," Sunseri says. He can't get his hands on enough oysters to ramp up operations. None of Sunseri's regular suppliers, including Jurisich, have started harvesting again. And because he doesn't have oysters to sell, Sunseri says he has lost all of his retail customers and two-thirds of his wholesale customers. "We were the premier oyster company in the New Orleans metropolitan area, and now we're not," he says. Sunseri says many New Orleans restaurants and markets used to buy only from him. Since the spill, they've had to buy from other processors and distributors. "And they feel loyalty to have to get some from them because they were able to have them when we didn't," he says. So, even if his regular suppliers start bringing in oysters early next year as planned, Sunseri says things won't return to normal for his business. "You know, people don't just turn on a light switch and then it's able to be like it was," he says. "That's not the way it is." With limited supply and higher prices, Gulf oysters also aren't on as many menus as they used to be.